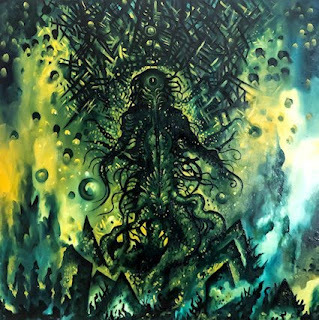 Sci fi inspired doom metal featuring reimaginings of Celtic folk songs and an Electric Wizard cover? Well you can sign me right up. Negative Wall are a new act on the Georgian metal circuit, these underground veterans are unafraid of showcasing their battlescars, and with Gammagelu showing their long term growth as musicians. This is a powerful first effort that is brash, over the top and hinting at so much more madness to come. Gammagelu is the sort of doomed offering that hints at much more to come. This all being said, the execution on Gammagelu is not quite where it needs to be. there are a loto f cool ideas at play here, but sometimes the performances just don't match up. The most glaring example is the cover of Torquemada 71 where the take on Jus Osborn's vocals is a bit too different for me to get into. By and large though, Negative Wall have shown with this debut that they have a depe understanding of the genre and that they are bringing some cool ideas to the fore. The thing is, sometimes those ideas feel like they need a little bit more refinement before they really make it to wax. At the end of the day, we are looking at a crowded genre and being able to differentiate yourself within that world is a really hard thing to do. Sometimes you can come up with a great concept but if you aren't performing as the best of the best then people simply aren't going to get it. this all being said, I think that doom nerds are going to enjoy the sheer dorkiness and over the topness of Gammagelu but watching the band start to really hone down on these ideas over the next few years is where the true excitement lies.